So the familiar version of Top Gear is over. The combination of Clarkson, Hammond and May will no longer appear on BBC2 at 8pm on a Sunday evening and talk about cars, cause chaos and general hilarity with their antics. Over the years they have taken what started as a dull car review show and turned it into an award-winning programme full of entertainment centred on a love for cars. Often the show caused controversy from offending people such as lorry drivers and Mexicans, to accusations of drink driving whilst heading to the North Pole. In that respect it was only a matter of time before controversy would finally cause the programme to implode. This almost occurred when crew members were put in serious jeopardy by an ill-advised special in Patagonia but the final blow was dealt by Clarkson himself. The incident has been widely documented in the press and resulted in the conclusion to the show as seen on Sunday 28th June. That final episode, with links recorded by Hammond and May in an empty studio, save for an obvious ‘elephant in the room’, was sombre. The credits rolled with no theme tune but silently, akin to occasions in soap operas where a character has died during the episode. However, it is perfectly apt as sadly the show is now dead. BBC Worldwide will continue to flog the Top Gear brand for all the money that can be squeezed out of it and the show will return with Chris Evans as a presenter. But whatever form that relaunched Top Gear does take I can only predict total and utter failure. The camaraderie between Clarkson, Hammond and May was irreplaceable and brought audiences to the show that crucially were not petrol heads but enjoyed watching them and what they got up to each week. Sadly, replicating that chemistry is surely an impossible task and therefore it is rightly seen that this is indeed the end for Top Gear. However, as we mark the end of one of the BBC’s most popular programmes it is only right that we look back at some of the highlights that the show brought viewers. Top Gear almost became synonymous with extraordinary races, often pitting the car against public transport, racing to the North Pole, across London and through Tokyo to name only a few. The two races in particular which will stand out in my memory featured extraordinary pieces of machinery, the Bugatti Veyron and steam locomotive Tornado. 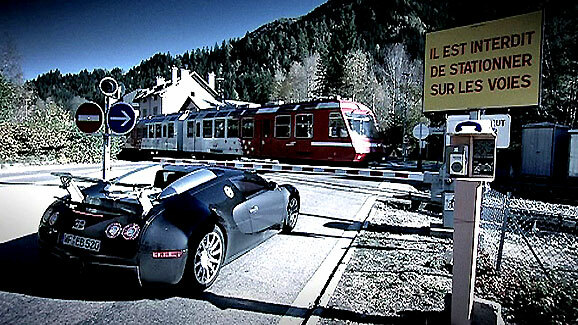 A simple race from Italy to London featured perhaps the greatest piece of motorcar engineering we are ever likely to see, the Bugatti Veyron. This car was quite rightly the winner of this race, during which Jeremy dazzled the viewer with the incredible statistics associated with it, for instance, 1001 bhp, 4 turbochargers, 10 radiators and a top speed of 253 mph. Rightly so it was described on the show as motoring’s “Concorde moment”, the best road car there is ever likely to be in our lifetime. In retrospect, James and Richard never really stood a chance up against a machine of that ilk. But it made for memorable television and is re-watched with great fondness on repeat channel ‘Dave’. The second race which sticks in my mind is the race from London to Edinburgh, James drove a Jaguar XK120, Richard on a Vincent Black Shadow motorcycle and Jeremy on steam engine Tornado. All 3 vehicles were fantastic and looked great. I may be wrong but I have a feeling it was the first episode of Top Gear to be made in HD and shots of Tornado going up the east coast were gorgeous and it is those images that will stick in the mind for a long time. 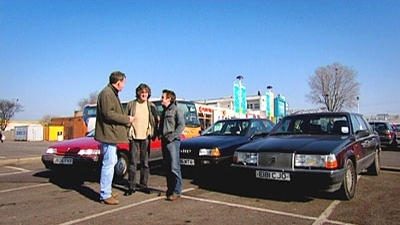 Something that Jeremy often highlighted during the show was that on this “pokey motoring show” they would regularly get incredibly high profile stars in the reasonably priced car. From Hollywood A-listers Tom Cruise and Cameron Diaz, to Formula 1 drivers such as Lewis Hamilton and Sebastian Vettel, every week the show would have a recognisable face appear. That alone is a perfect indication about the popularity of the programme. All of the guests provided great interviews; the informal nature of the questioning as opposed to a typical televised interview meant that the guest was relaxed and more forthcoming. Also, over the years it became a popular thought for viewers to wonder how fast they could go around the track. Fortunately, through the video game Gran Turismo 5 viewers could test themselves against famous corners such as Gambon and the hammerhead. One of the best challenges, of the many, that the show came up with involved a budget to go and buy a specific car. One of my favourites was the challenge to buy a mid-engine Italian supercar for less than £10,000, most notably for James arriving at the meeting point on the back of an AA truck and all the cars failing to reach their final destination. Another was finding the perfect car for 17 year olds for £2,500; I don’t think I have laughed as much as I did watching that challenge. Another challenge involved creating amphibious vehicles and so successful was it the challenge was revisited but taken to a new level. In the first challenge Jeremy sank hilariously, so very close to the finish, James struggled with his Triumph Herald sailing boat on the land before even getting to water and Richard’s ‘damper-van’ fared little better. 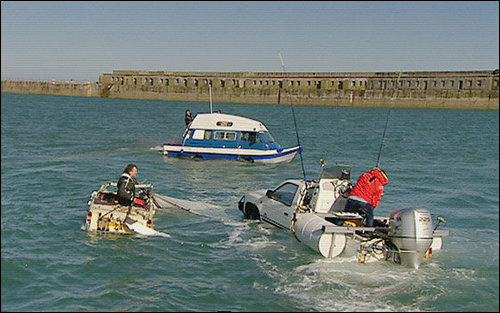 So it was even more surprising when the challenge was elevated to push the trio to attempt an English Channel crossing. Amazingly, Jeremy’s Nissan pick-up truck made it to French soil, one of few occasions where one of the vehicles managed to complete the challenge. As a part of a film about hot hatchbacks the three presenters got the chance to drive the legendary Circuit de Monaco. As well as the obvious visually impressive track, it was fascinating to see the corners you might have gone round on computer games done for real by drivers who are not professionally trained and in regular cars. Most viewers who have seen Formula 1 races will be have been very envious of that opportunity. This was an extraordinary film. Driving through Ukraine Clarkson, Hammond and May tried their utmost to run out of fuel so they didn’t have to enter the exclusion zone. Unfortunately, Jeremy and James still had petrol so the cars ventured into the radioactive nightmare. 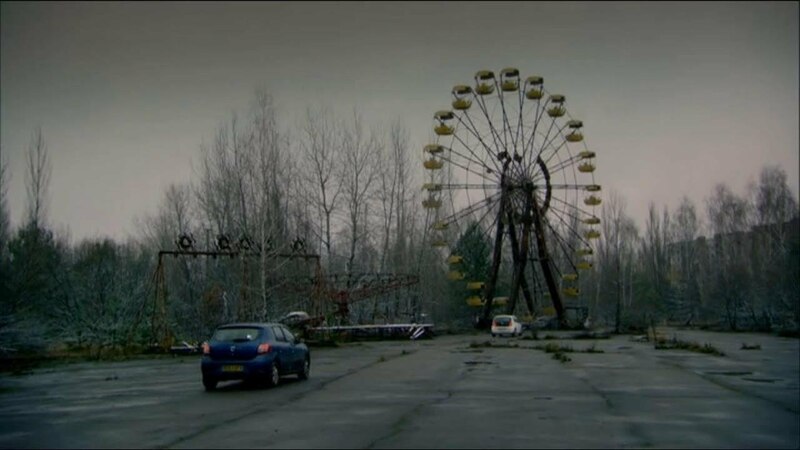 Chernobyl is one of the eeriest locations on Earth and for cameras to capture it was extremely rare. Abandoned housing and the creepy playground alone make it for one of the most spectacular sights but for all the wrong reasons. The unnerving ticks of the Geiger counters heightened the reality of what is perhaps one of the most dangerous journeys ever made by the Top Gear. In September 2006, Richard Hammond was involved in an accident after a jet-powered car he was driving at over 280mph suffered a tire blow out, causing the car to spin off, flip upside down and jammed his head into the ground. As a result Richard suffered a significant brain injury but eventually made a full recovery. The episode where the footage of the accident was shown became the first of the new series that had been delayed to allow Richard to recover. During the episode Richard discussed what had happened and his recollections of the accident. The footage itself was shocking enough and really highlighted how serious the accident was. Fortunately, Richard did make a full recovery and quite rightly he had a spectacular reception but then once it was talked about his request to not mention it again was respected. The incident really underlined the relationship between the three presenters and it is that chemistry which made the show a success. 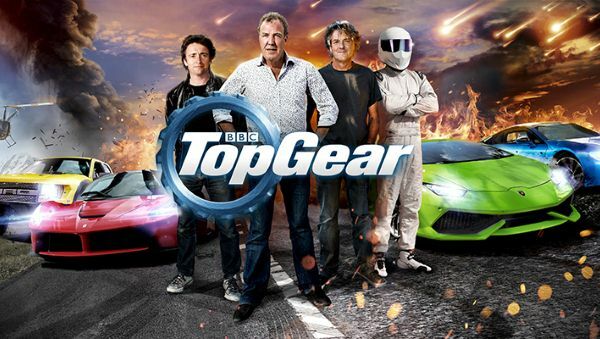 Almost certainly the trio will be back again on our screens for another broadcaster but it will not be on Top Gear and despite a dramatic end viewers will fondly look back on what the show did provide in terms of entertainment.